Moulin, Dwight E., et al. Moulin, D. E., Clark, A. J., Gilron, I., Ware, M. A., Watson, C. P. N., Sessle, B. J., … & Velly, A. (2007). 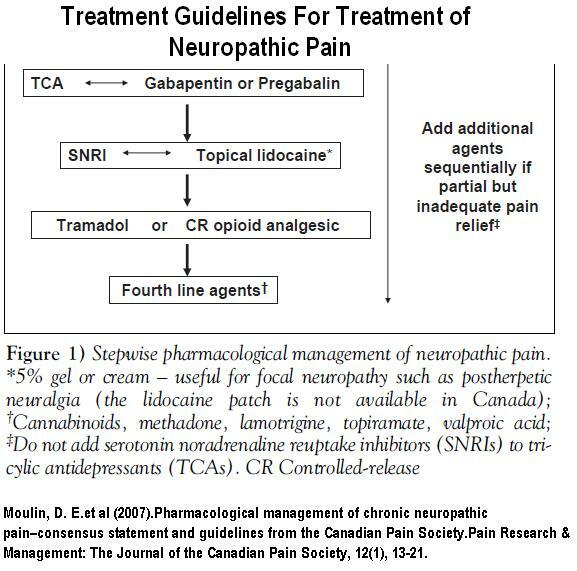 Pharmacological management of chronic neuropathic pain–consensus statement and guidelines from the Canadian Pain Society. Pain Research & Management: The Journal of the Canadian Pain Society, 12(1), 13-21. 3. Rowbotham MC. Pharmacologic management of complex regional pain syndrome. The Clinical journal of pain 2006; 22: 425-9. 4. Cossins L, Okell RW, Cameron H, Simpson B, Poole HM, Goebel A. Treatment of complex regional pain syndrome in adults: A systematic review of randomized controlled trials published from June 2000 to February 2012. European journal of pain 2013; 17: 158-73. 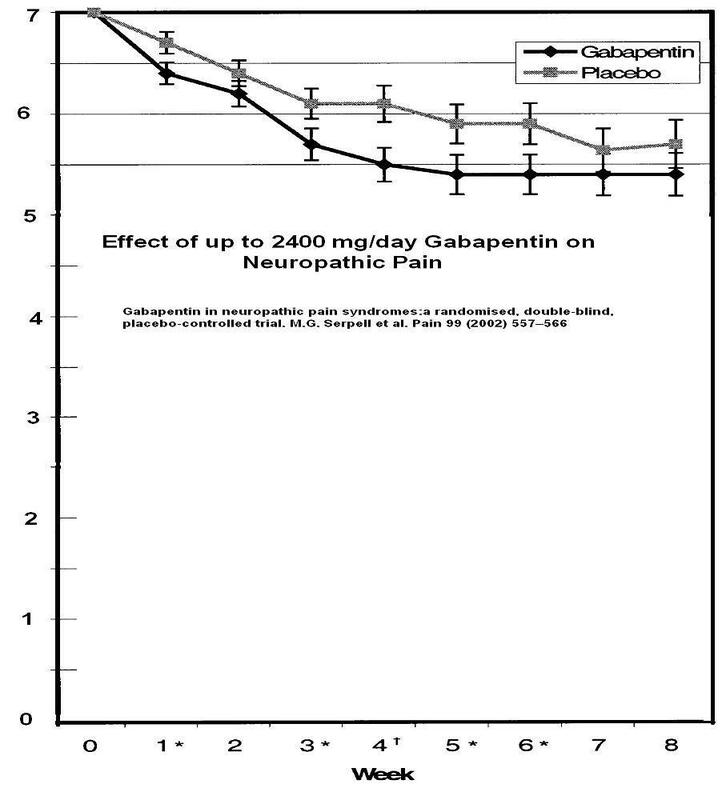 Gabapentin in neuropathic pain syndromes: a randomised, double-blind, placebo-controlled trial. Though they talk glowingly about summations of certain findings, the overall pain was not statistically better than placebo after 6 weeks (the lack of stars at bottom). I have extended the graph to the bottom and it is obvious changes are not great. To be fair however, there was a 20% subgroup that did get over 50% improvement though I cannot say if it would last..
Also it is common to take patients to 3600 mg/day now though how many can tolerate that I do not know. The other Jewel was pregabalin. 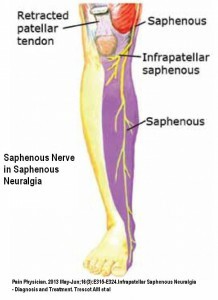 It failed to show longterm effectiveness in a recent trial of chronic sciatica pain – what 1/2 of neuropathic pain patients suffer from. 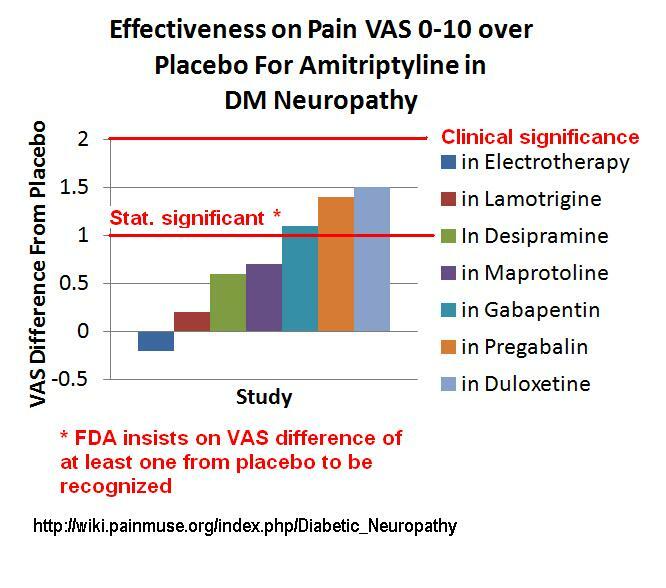 Below is the effectiveness of lower dose amitriptyline in various studies: A drop of 2 is considered CLINICALLY significant. However, I had a discussion with Dr. R. Dworkin, one of the heads of the US neuropathic pain group, about this clinically significant level and he contends if the drug is clinically safe and tolerable, then less effect is still important. – so try it and see. Valproic acid probably not as effective as other 4th line measures; Topical lidocaine maybe not as effective. (Raised by me) Neuropathic pain drugs do not work well on radiculopathy pains which constitute nearly 1/2 of chronic neuropathic pains. Division of the pyriformis muscle for the treatment of sciatica. Postlaminectomy syndrome and osteoarthritis of the spine. Epidurals are fraught with the need for subject to lie down for 20 minutes after injection with bad side down, and the issue the shot could get on the wrong side of epidural septum. The mineralcorticoid effects of the steroid are pro-inflammatory which could blunt response. I feel the day of steroid alone shots should be over and steroid plus entanercept shots should be done -with the original successful 25 mg – not like a recent negative pathetically-dosed 4 mg study used recently. Ketamine shots – have found 10 mg ketamine given twice or 3 times into deltoid muscle – separated by 15 minute each – could capture significant control of pain and mood. Depersonalization side effects could be avoided by terminating shots should subject start feeling”funny”. One subject had an episode of bladder frequency on 15 mg X 3 divided by 15 minutes each, but when retried 6 months later, has never had a problem with 10 mg X 2 (a dose she had originally been on and managed well on). However, still not a drug of people with bladder issues. Treatment of reflex sympathetic dystrophy with pamidronate: 29 cases. Kubalek I, Fain O, Paries J, Kettaneh A, Thomas M.
5 Day Infusions: – mentioned the 5 day treatments to one anesthetist – his comment – “never going to happen”. It will take legislature to make it happen because the medical community will not spare the resources. IV Ketamine – Pain Rescue For Refractory Pain Flareups – http://painmuse.org/?p=489 -mentions how some had daily infusions for 4 days – (suspect 5 would be better). 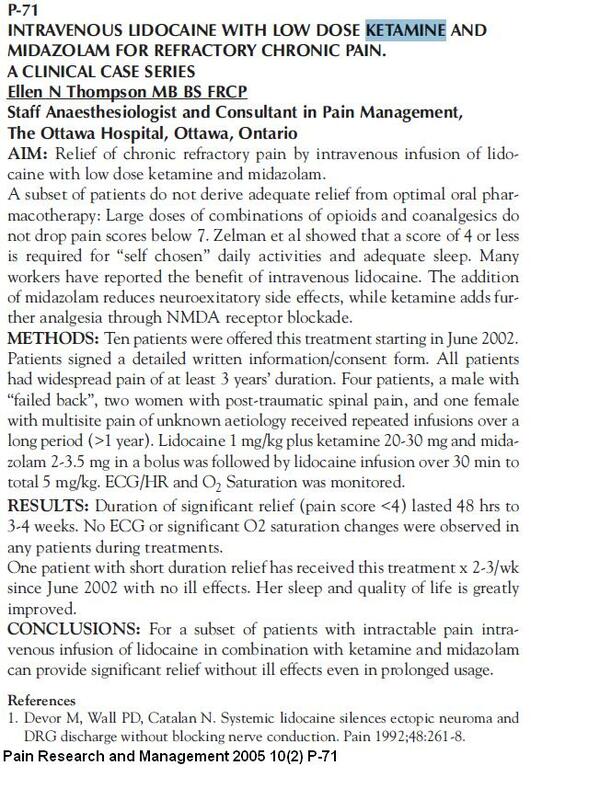 Prolonged ketamine infusion as a therapy for Complex Regional Pain Syndrome:Synergism with antagonism? http://www.ncbi.nlm.nih.gov/pubmed/23701138A good update review of IV treatments for chronic pain can be reviewed free here:Pain Physician. 2013 May-Jun;16(3):231-49. Intravenous infusions in chronic pain management. Kosharskyy B, Almonte W, Shaparin N, Pappagallo M, Smith H.
Injecting myofascial triggers – I often use 5% lidocaine to get longer lasting results but stay clear of spine – results are often much better when combined with ketamine shots. Prolotherapy – Backs that tire out standing or sitting too long make one suspect that is an issue. I have been experimenting with dilute testosterone injection which are less painful. Not seen at all here. Physio techniques – Strength training has been shown to play a prominent place in chronic knee pains and is too big a topic to go into here. Methadone – because of its dual mode of action (NMDA block and opioid mu receptor effects), it is the king of painkillers. One of the palliative care doctors might be willing to be involved. Spinal and peripheral nerve stimulation – a possible 3 year wait if at all here. Resolution of Intractable Bilateral Neuropathic Lower Extremity Pain of Unclear Etiology: A Case Report. Botox injections – significant relief reported in piriformis syndrome and selected cases of back pains. intradermal D5W injections – If one is careful, one can feel the nerves under the skin in painful areas as being tender – If you pucker the skin and inject above it ever cm or so with D5W superficial to nerve, the soreness will temporarily remit. Repeated injections can make it more lasting. I injected saphenous nerve at adductor tunnel and it gave dramatic relief of pain except a patch just above kneecap – making me think this was maybe more obturator nerve too. I taught her functional release (counterstrain) for psoas and piriformis on other side – you put the muscle in a short painfree position for 90 seconds, and the muscle will temporarily forget it is in pain… I ran blood work for inflammatory issues and started her on a steroid pulse (40 mg dexamethasone/day in divided doses – note don’t use this dose on a diabetic). I considered getting in touch with Dr. Carmen Johnson – one of our palliative care doctors to use methadone. By the next morning her ESR came back as 42 and the pulse steroid was already lowering her pain levels. I referred her to a rheumatologist (No temporal arteritis symptoms so will have to wait) re Polymylagia Rheumatica. She will start on 20 mg/day Prednisone after the pulse. Given that the steroid effects seem to wane after the last use, I wonder if methotrexate (not favored by out rheumatologist) or etanercept should be added. A biphosphonate will be added once sure of stomach tolerance to steroids. Will need to check blood pressures and glucose levels. I imagine I will have to deal with here knees (restricted knee flexion and probable OA knees) – and multiple triggers – especially piriformi and subscapularis. B12 shots were taught for this lady. I want people to realize there are always new options (heck, I have started 3 fairly severe back pain cases on 100 day antibiotics given a positive study on it use). There however, needs to be the political will to make it happen. Given that every third household has significant chronic pain issues, it is an invisible tip of the iceberg. Our coping-training pain clinic in Saskatoon is closing down due to lack of funding; and our anesthetists have to impose on post operative care (much to the dislike of some staff) to do their blocks in Regina as there is no pain clinic here. Sadly, the same people who ignore this issue will have it slammed in their face – by old age where chronic pain can run rampant – and in if you get dementia, possibly cruely untreated. – So ironic. The medical community will not spare the resources necessary to make 5 day infusions or other advanced treatments possible. This needs to be addressed politically at election time. This entry was posted in Drugs, Fibromyalgia, Injection, IV therapy, Manual Med, myofascial pain, neuropathic, Pain Dystrophy, piriformis. Bookmark the permalink. 9 Responses to Severe Neuropathic Pain – Only 1/4 Respond to Standard Drug Protocols – What Else Is There? I have had four lumbar surgeries since 2000. The first two were laminectomies/ discectomy of the L-4 / L-5 discs. Both of these were successful. In 2010 I hurt myself lifting an object and compressed my L-5 nerve root. I underwent decompression surgery in 2011 of the L-4, L-5 and S-1 nerve roots and again in 2012 adding spinal stenosis to the list at the L-3 and L-4 levels. Neither one of these surgeries has given me any relief. I have pain along both ankles, the left foot and around my right hip area. I am trying to find out if you can recommend a physician ( in the USA or outside the USA ) who can take a look at my test results and diagnose correctly what is going on with me and hopefully propose a treatment. I recently had an MRI, an EMG and a CT Myelogram but none of them show why I am still having pain. I appreciate any guidance or help you can provide. Thank you. Probably one of the more well known pain clinics would be the Messana clinic in Maryland. 20 years ago they published an article on how 2/3 of chronic pain sufferers that were told there was nothing the matter with them – actually had well definable lesions. and lots others less easily treatable.. Thank you very much for your comments and information. I really appreciate your inputs. I am a resident of Montreal, with CRPS of the elbow at 4 months post-trauma. I have read the 2013 Verenna article, and it looks very promising (even too good…). Instead of wasting time (and worsening the prognosis) with ineffective nerve block or other treatment, I would like to find a physician (rheumatologist/neurologist/anaesthesiest…) who would be prepared to administer the Verenna protocol, with the alternative biphosphonate, since pamidronate is not available in Canada. Any suggestions on how to find such a courageous soul? It improves both pain and mood but needs repeated use. – how tender are skin nerves that D5W could be injected over top? 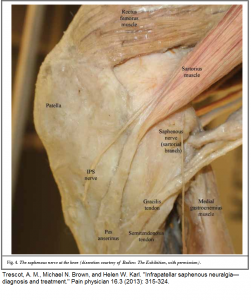 – Are there steroid responsive joint or tendonitis issues? – are there muscles that can be helped by brutal transverse massage? Really desperate cases can respond to continuous IV lidocaine given in New York or IV ketamine given in Chicago but those would be expensive. A team approach with anesthesia and physio etc works best but I know how long it takes to get to see a pain clinic – good luck there.. I am an interventional pain management specialist, and I appreciate some of your comments and observation. In my soon-t-be-published text book of peripheral nerve entrapments, I have even included the dorsal scapular nerve that you mentioned in another blog. However, since it is my image of the knee dissection that you are using in this posting (I had a press pass to take images of the Bodies, The Exhibition and then modified the images myself), I would have appreciated at least an attempt at asking permission to use the image (which I would have been glad to provide). Sorry, that was just rude of me.